Product prices and availability are accurate as of 2019-04-10 05:16:55 UTC and are subject to change. Any price and availability information displayed on http://www.amazon.com/ at the time of purchase will apply to the purchase of this product. 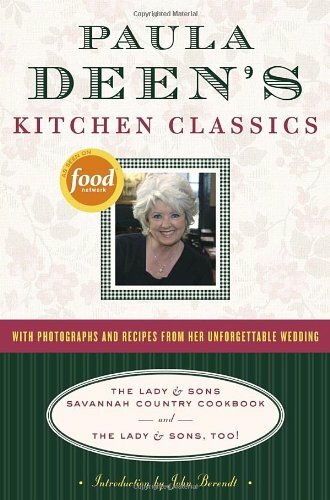 As owner and proprietor of The Lady & Sons restaurant in Savannah, Paula Deen is one of the South’s most celebrated chefs. Now two of her cherished culinary classics–The Lady & Sons Savannah Country Cookbook and The Lady & Sons, Too!–have been combined into one delicious volume, available in hardcover for the first time. As a special treat, Paula Deen’s Kitchen Classics includes candid photos from Paula’s recent wedding, as well as scrumptious new dishes from the reception, tasty creations that have never appeared in any of her other books.Here are hundreds of mouthwatering, easy-to-follow recipes. For appetizers, soups, and salads, whip up some Georgia Spiced Pecans, Mini Onion Quiches, She Crab Soup, and Gingersnap Pear Salad. The delectable main courses will be the hit of any family supper, Sunday picnic, or dinner party. Who can resist Beaufort Shrimp Pie, The Lady’s Oven-Roasted Ribs, Ron’s Grilled Peanut Butter Ham, or Hot Savannah Chicken Salad Casserole? Enhance any meal with heavenly side dishes like Crunchy New Potatoes, Collard Greens, and, of course, Fried Green Tomatoes. And what meal is complete without sinful desserts–from Mississippi Mud Cake and Cherry Cream Cheese Pie to Sliced Nut Cookies and Butterscotch Delight? Is your stomach growling yet?Seasoned with Paula’s practical kitchen hints and her friendly, no-nonsense observations, Paula Deen’s Kitchen Classics is the perfect gift for experienced cooks, budding chefs, and anyone who loves comfort food.